As honored as we are to be two-time winners of the Good Food Awards, the best part of the experience was in the details (as is usually the case). In our line of work, this is as close as we come to a professional meeting or academic conference. When else have we been able to meet a bunch of fantastic pickle makers and other food producers and talk geeky pickle-talk?? Not very often. 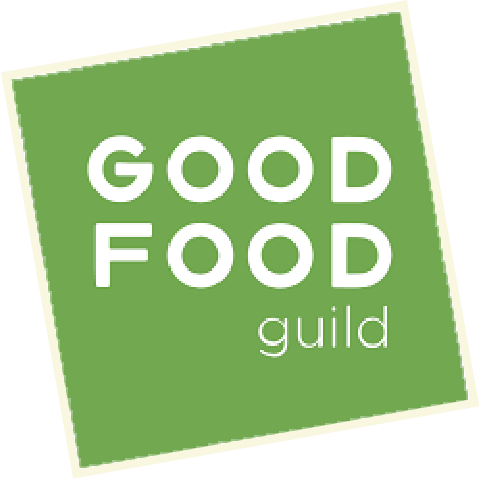 If only for that, we thank the Good Food Awards (GFA) for creating the opportunity. The ceremony was a terrific event, and organizers did a great job of making GFA feel like a truly special honor. 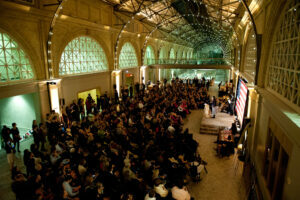 We gathered at the historic and impressive Ferry Building, a bona fide shrine to local food. Downstairs, the Ferry Building food shops and restaurants bustled with hungry activity while the gigantic upstairs hall filled with food producers dressed in their best. What exactly does “Black Tie Optional” mean to a food producer? The range of interpretations was fully featured at this event. From tuxes to trousers – foodies and members of the press turned out to witness the announcement of the 2012 winners. Alice Waters again hosted – this time acting as the medal-distributor – along with keynote speaker, Ruth Reichl. Both stood to the side of the stage and greeted each winner with a medal and a handshake before guiding them to the stage to stand with their fellow category winners to accept their award. Amidst the clinking of mason jars full of local hard cider and the excited chatter of nutriment networking, a speaker selected from each category (voted by the category winners) gave the acceptance speech. 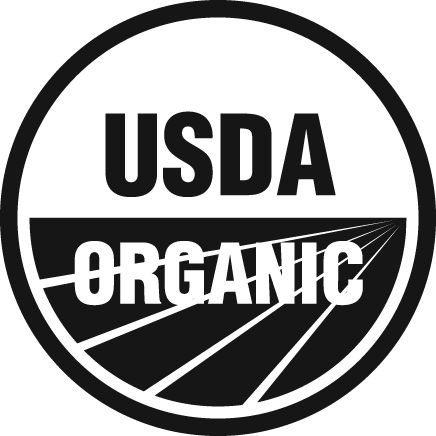 Many spoke of changing times, the ability to source quality ingredients that were not available a decade ago, and the increasing consumer demand for tasty and responsible food. Over such a wide variety of categories (coffee, chocolate, beer, preserves, charcuterie, pickles, cheese, spirits), there were many interesting points that could have served as keynotes in themselves – but in the interest of getting to the tasting tables, talks were limited to 3 minutes each. Real Pickles’ Dan was selected to speak for the pickle category (you can read his speech here). He was a little (very) nervous but found out when he sat down with his fellow winner-speakers that he wasn’t alone. He really appreciated the opportunity to talk in the ceremony about the idea of building regional food systems, since that’s a big part of why Real Pickles got started, and it’s an effort that many other winners are involved in, as well. After the ceremony, we headed downstairs for tasting!!! The Ferry Building continues its history as a terminal for ferries bound for points across the bay. But now, it is a gathering place for all who love good food (and have some spending money). During the week, food purveyors vend their victuals to ferry passengers, financial district lunchers, and tourists alike – from locally-roasted Blue Bottle Coffee to regional Cowgirl Creamery cheeses to raw Hog Island oysters (my favorite, anytime of day). You can even browse the shelves of an oversized armoire full of amazing jams and pickles, which serves as a mini-shop for Happy Girl Kitchen. 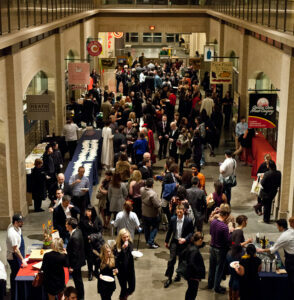 For the GFA tasting party, the Ferry Building shops were closed, but tasting tables for each region were set up in the hallway by region. Each region’s table was lined with plates containing a bite-sized portion of each winning product. For the East region, we enjoyed marvelous mouthfuls from Sour Puss Pickles and Sweet Deliverance in NYC, Formaggio Kitchen in Boston, Cellars at Jasper Hill in Vermont, and Rogue Chocolatiers – new neighbors in Western Massachusetts! Washing the regional mixture down with gulps of winning beer from familiar Smuttynose and faraway Alaskan Brewing Company, we proceeded to the next table for pleasurable provincial provisions. Real Pickles’ Garlic Dills were one of a handful of products chosen by San Francisco chefs to be showcased in special dishes specifically for the event. Evan and Leo, who we got a chance to meet at last year’s awards, are opening up a Jewish deli in San Francisco called Wise Sons Deli. They’ve been hard at work perfecting their fermented pickle and cured pastrami recipes for the new place. 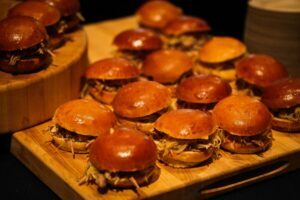 Meanwhile, they prepared and served a very special dish at the reception: Brisket braised in Smuttynose Robust Porter with slaw and Real Pickles’ Garlic Dills on a sea salt challah bun. Quite a tasty little sandwich, though half of mine ended up on the floor by way of my dress … figures. The next morning, we headed back to the Ferry Building for the GFA Marketplace and the regular Saturday farmers market. The Marketplace was a great chance to taste some of the winning products we’d missed the night before and meet some more winning producers. We got a chance to try a yogurt cheese from Sonoma County, which was wondrous. Someone in the Northeast needs to study with Saint Benoit and get some tips. We also enjoyed meeting some folks from Colorado and tasting their Avalanche goat cheese – yum. Moving on to the regular SF farmers market, we were heartily impressed. Talk about a regional food system! This endless farmers market is brimming with regional foods. Clearly, California has a certain climate advantage over 4-season New England for produce – but there was still plenty to be inspired by in terms of implications for our own food system back home: veggies, dairy, seafood, charcuterie… and a proud showing of lacto-ferments! We got to taste astonishing horseradish-leek kraut from Farmhouse Culture, as well as pick up a bottle of refreshing kimchi juice from Happy Girl Kitchen. It was great to see a farmers market supporting two bustling pickle booths (both GFA winners, I might add). 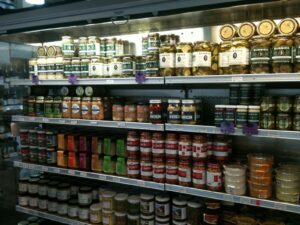 The kraut section at Rainbow Grocery! We witnessed West Coast support of lacto-ferment beyond just the Ferry Building. Later on, we stopped in at Rainbow Grocery, a very impressive food coop in the Mission District, and found our jaws dropping at the sight of the raw kraut section. So many producers … so much shelf space. One employee noticed our reaction and said, “Yup, we like our kraut!” Some say that California leads the way, predicting the market, harbinger of the next big societal trend. Well, New England, are you ready for more raw kraut?!? Before the GFA weekend came to an end, we also experienced what was perhaps the biggest highlight for us: A pickle posse party! As pickle-makers working in a rural area and only selling our products regionally, we only get so many opportunities to meet other people involved in our craft. The GFA weekend is a great way to get a bunch of us together. 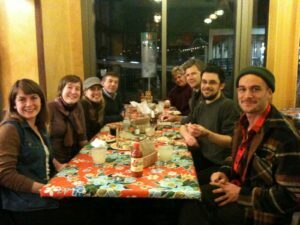 Many of us from this year’s group spent an evening embracing our inner pickle nerd by waxing eloquent about preferred cabbage slicing equipment, debating the fundamentals of fermentation chemistry, and deliberating about the challenges of buying local vegetables and managing a small business. (Pictured here: Ann’s Raspberry Farm, Sour Puss Pickles, Emmy’s Pickles and Jams, Real Pickles, and Firefly Kitchens. Olykraut joined us later in the evening.) In what can sometimes be solitary work, it feels good to be connected to such a great group of talented food makers, creative entrepreneurs, and all-around fun and interesting people. We’re excited for the next opportunity (fingers crossed for next year)!